Anonymous hackers launch DDoS attack on Egypt ! Hot on the heels of similarly politically-motivated attacks against websites belonging to the governments of Tunisia and Zimbabwe, hackers are bombarding official websites in Egypt with a DDoS attack. The hackers' current target is believed to be the Egyptian Ministry of Communications and Information Technology, although at the time of writing it was still accessible. "Anonymous wants you to offer free access to uncensored media in your entire country. When you ignore this message, not only will we attack your government websites, Anonymous will also make sure that the international media sees the horrid reality you impose upon your people." The internet attacks are against a backdrop of anti-government protests in Egypt, with police using tear gas and rubber bullets to break up demonstrations. 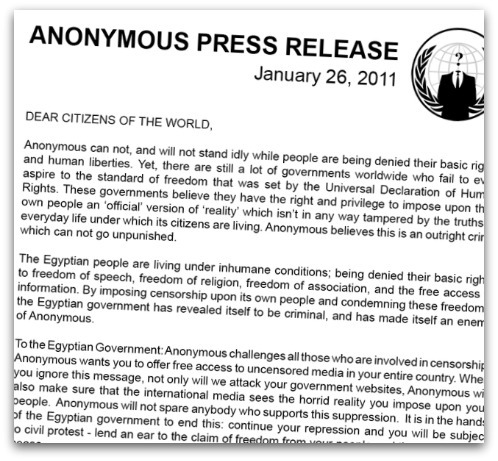 "Anonymous" has used the internet to rally volunteers to participate in the attacks - dubbed "Operation Egypt" - seemingly in response to the country's attempts to crack down on public protests and block access to websites such as Twitter. Yesterday Twitter confirmed that their site was being blocked by the Egyption authorities and commented that they believed that "the open exchange of info & views benefits societies & helps govts better connect with their people". Of course, blocking Twitter and other internet resources can be an effective way of making communications between protestors much more difficult - but it does often raise the ire of politically-minded internet users in other countries. Of course, use of tools like Low Orbit Ion Cannon (LOIC) may make it easy to use your PC for a denial-of-service attack, but can also do a poor job at hiding your participation rom the authorities. Anyone considering signing-up to join in the DDoS attacks would be wise to remember that they could be breaking the law.